Deputy Attorney General Rod Rosenstein, in his first public remarks since former FBI Director James Comey's firing, told members of the House of Representatives on Friday that Comey "was a role model." 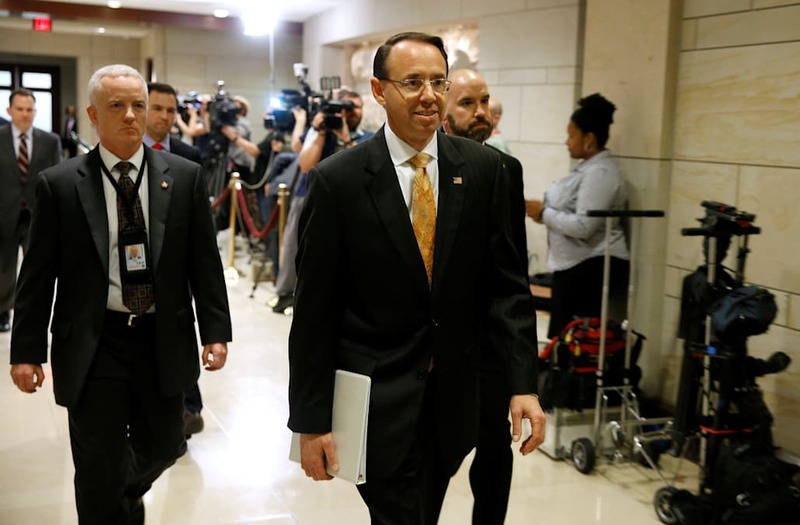 Rosenstein briefed lawmakers on the events leading up to Comey's dismissal last Tuesday, as well as his decision on Wednesday to appoint a special counsel to lead the FBI's probe into Russia's election interference and whether Trump's campaign team was complicit. "Before I discuss the events of the past two weeks, I want to provide some background about my previous relationship with former Director Comey," Rosenstein said, according to a copy of his prepared remarks released to reporters after the briefing concluded. He continued: "I have known Jim Comey since approximately 2002. In 2005, when Mr. Comey was Deputy Attorney General, he participated in selecting me to serve as a US attorney. As a federal prosecutor, he was a role model. His speeches about leadership and public service inspired me." Rosenstein went on to say, however, that he thought Comey's decision to hold a press conference "concerning the federal grand jury investigation of Secretary Clinton's emails" last July "was profoundly wrong." That echoed what he wrote in a memo last week — the day Comey was fired — outlining what he saw as Comey's mishandling of the investigation into Hillary Clinton's use of a private email server. "Director Comey attended the Maryland US Attorney's office training seminar on October 27, 2016, and gave a detailed explanation of his reasons for making public statements about the conclusion of the Secretary Clinton email investigation," Rosenstein said. "I strongly disagreed with his analysis, but I believe that he made his decisions in good faith." On October 28, Comey sent a letter to Congress announcing that he was going to revisit the Clinton email investigation. "He subsequently has said that he believed he was obligated to send the letter," Rosenstein said on Friday. "I completely disagree. He again usurped the authority of the Department of Justice ... and guaranteed that some people would accuse the FBI of interfering in the election." Comey's decision to send that letter was praised by then-candidate Donald Trump, whose aides initially used Rosenstein's memo accusing Comey of flouting DOJ rules as justification for his dismissal. Trump told NBC two days after firing Comey, however, that he intended to do it "regardless" of Rosenstein's recommendation. Some lawmakers were apparently frustrated that Rosenstein would not disclose more details about what led up to Trump's decision to fire Comey. He was "very guarded" about Comey's dismissal, one Republican representative, who wished to remain anonymous, told CNN. A Democratic member of the House described Rosenstein as "frustratingly cautious." Rosenstein's opening statement did not mention a New York Times report, published on Tuesday, that Comey had written memos describing what he felt were inappropriate efforts by Trump to influence the FBI's Russia probe. It is unclear if Rosenstein addressed the report in the closed portion of the briefing. But Rosenstein did confirm to lawmakers that he learned of Trump's decision to fire Comey one day before writing the memo outlining his alleged misconduct, which he emphasized was "not a legal brief" and "not a finding of official misconduct." "On May 8, I learned that President Trump intended to remove Director Comey and sought my advice and input. Notwithstanding my personal affection for Director Comey, I thought it was appropriate to seek a new leader." Trump acknowledged in his interview with NBC that "the Russia thing" was on his mind when he decided to fire Comey, leading to questions about whether he fired Comey to impede the investigation into his campaign's ties to Russia. Reports surfaced soon after Comey was fired that he had asked the DOJ for additional resources to conduct the probe, but Rosenstein pushed back against those claims on Friday. "I am not aware of any such request," he told members of Congress. "Moreover, I consulted my staff and acting FBI Director Andrew McCabe, and none of them recalls such a request." The rest of the hearing, as it was when Rosenstein briefed the Senate on Thursday, was closed. But some Democratic lawmakers have emerged troubled from the briefings, in which Rosenstein explained his decision to appoint a special counsel to lead the FBI's Russia investigation. "Rosenstein testimony to Senate was profoundly disturbing," Sen. Jeff Merkley tweeted Thursday. "Just came out of the House briefing by the Deputy AG," Rep. Seth Moulton tweeted on Friday. "It renewed my confidence that we should have no confidence in this Administration." "This is about the fight for the soul of our democracy," Rep. Elijah Cummings told reporters after emerging from the closed-door briefing. "We cannot afford to lose this one."